At Yenzer Family Dental, our number one goal is to help you keep all of your natural teeth for as long as possible. Unfortunately, whether due to decay, injury, or other factors, sometimes it is necessary to remove a tooth. However, thanks to Dr. Jeff Yenzer’s years of experience and his light touch, this potentially nerve-inducing procedure is now quick, simple, and virtually painless. This is the method we’ll use for teeth that have already erupted. 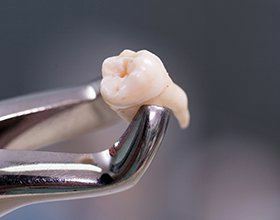 After thoroughly numbing your mouth, Dr. Yenzer will hold the tooth with a pair of dental forceps, and then he’ll gently rock the tooth back and forth until it slips out on its own. We never “pull” teeth here! 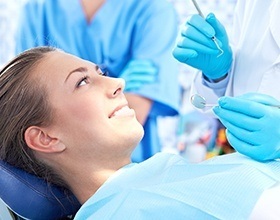 Often a patient is completely unaware when their tooth actually comes out! This is often necessary for the most commonly extracted teeth, the wisdom teeth. Most people simply don’t have enough room in their mouth for this third set of molars, so when they start to come in, they usually cause a multitude of problems, including jaw pain, teeth crowding, and even an infection. We’ll try to keep an eye on your wisdom teeth so we can remove them before they cause you any major issues. For a surgical extraction, you’ll be put under a lighter form of general anesthesia so you’ll basically sleep through the entire procedure. Dr. Yenzer will make a small incision in the gums, remove any bone that is covering the tooth, and then extract the tooth. You’ll be woken up when he’s finished, and then you’ll need about a week to recover before you can return to your normal activities. Thanks to the pain medication he’ll prescribe you, your recovery should fly by smoothly. Contact Yenzer Family Dental today if you have any questions about extractions or if you’d like to schedule an appointment. Located in Chesterfield, MO, Dr. Yenzer and our staff have dedicated ourselves to helping patients achieve and maintain optimal oral health using care that is always comfortable, friendly, and always high-quality.